Following quickly on DML’s kit No. 7278 (Pzkw. IV Ausf. G Early Production) is this kit for the earlier Pzkw. IV F2 and initial production G models. 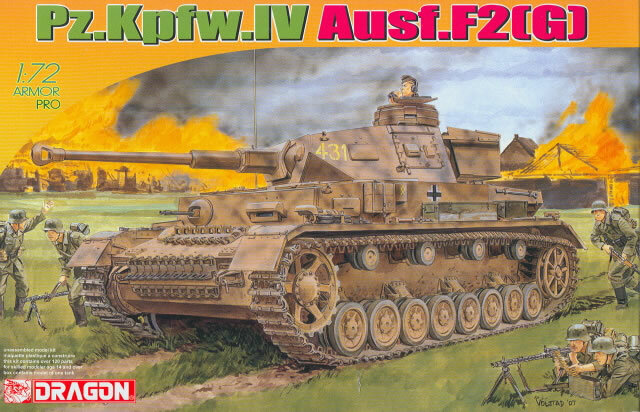 It has several modified sprues as well as the earlier “kugel” muzzle brake of the F2. Like its predecessor this kit is virtually new from the ground up and the only parts it appears to share with previous kits are the tracks, which are single run DS plastic ones. As before the kit identifies them as “Sprue X” but they are stamped “E” so I am assuming they are from one of the earlier kits; those were noted as having the tracks run long for sagging. Each bogie assembly here consist of five parts: carrier, road wheel pairs, and road wheel centers. Oddly the centers also appear to carry part of the tires, so other than molding fidelity it does not seem to offer any assistance for painting. Detail, however, is outstanding in this (or even some larger) scale. The lower hull is in one piece (part Z) but requires a separate bow plate applique and two-part stern plate. The modeler has an option for spare tracks or empty carrier at the bow. The upper hull has all hatches as separate parts and each viewer has both a cover and a mechanism as separate parts. The upper hull details are provided by applique sides attached to the central body (part Y) so welds and other details are apparent. The fenders are separate assemblies and attach along with the glacis plate in Step 5 but require some holes to be drilled out first. The turret is pretty detailed in this scale, with the gun assembly consisting of 9 parts, but the antenna deflector seen on some early F2s (or converted F1s) is not provided. The barrel again uses a slide molded hollow muzzle brake in one piece and inserts into a sleeve which then fits to the recoil housing; note that even the machine gun barrels are slide molded (as is the exhaust pipe on the muffler) so the modeler does not have to open them up. Six different finishing options are provided along with a targeted sheet of Cartograf decals: Pz.Rgt. 8, 15th Panzer Division, Tunisia 1942 (sand - black 8); Pz.Rgt. 15m 11th Panzer Division, Russia 1942 (grey - white 12); Unidentified Unit, Eastern Front 1943 (grey/sand mottle - black 421); Pz.Abt. 204, 22nd Panzer Division, Russia 1942 (grey/sand mottle, white 924); Pz.Rgt. 29, 12th Panzer Division, Russia 1942 (grey - white 613); and Pz.Abt. 1, 1st SS Panzer Division LAH, France 1942 (grey - white outline 316). A sheet of Cartograf decals are provided. Overall this compliments the earlier kit and does make a number of detail changes, sure to be popular with German small-scale fans. MA 4 Etched brassThanks to Freddie Leung of DML for the review sample.